We watch for them every winter, anticipating their return to our fields, lakes, and sea shores; the southern end of their annual migration. They begin to arrive at the end of November, a few more each day, until - quite suddenly, it seems - there are large flocks of them gathered throughout the valley. This morning our grey weather has returned. The brief, snowy interlude has passed, and it is raining. The clouds are so low that the mountains that encircle our valley seem to have disappeared, and the mist rising from the forest blurs the boundary between land and sky. Farm fields, edged in tall dark ranks of fir and spruce, hold silvery mist in their hollows, the swans appearing like ghosts within it. Adolescent cygnets, still soft grey, can disappear entirely into the the translucent swirls, appearing again like apparitions right before you. The lake, its waters perfectly still, reflects the silver sky above so perfectly that you can see the clouds more distinctly by looking down than you can by gazing up. Along the shore, swans mingle with geese and ducks, the elder statesmen of the waterfowl world, maintaining their aloof dignity even as their neighbours squabble and gossip all around them. Less than graceful on the strand, they move into the water and transform from stolid matriarchs and rounded worthies to something more akin to angels. A flotilla of grand, white birds sails across the water; silent, graceful, its movement so smooth that it barely ripples the surface. They don't take from the reflection of the sky, but add to it: A symmetry of silver and white, forming perfect heart-shaped Valentines each time a head is lowered to touch the water's surface. I am not their only audience. Heron sentries posted along the edges of the water pause from their quest for small silver fish and raise their heads to watch the swans sail past. Gulls, ever noisy and inquisitive, swoop and dive around them, and are completely disregarded. An eagle circles overhead and then settles in the bare top of a tall, dark fir tree, his keen yellow eyes watching their progress as the flotilla sails beside the shore. There is a sort of peace to be found in regarding these creatures, in feeling the rain on my face, in watching the movement of the birds, and in admiring the quiet beauty of the scenery. I am reluctant to leave it. My fingers grow cold so I stow my camera and don my gloves. I open my umbrella. And still I stand and watch, and listen, until I know I can linger no more. 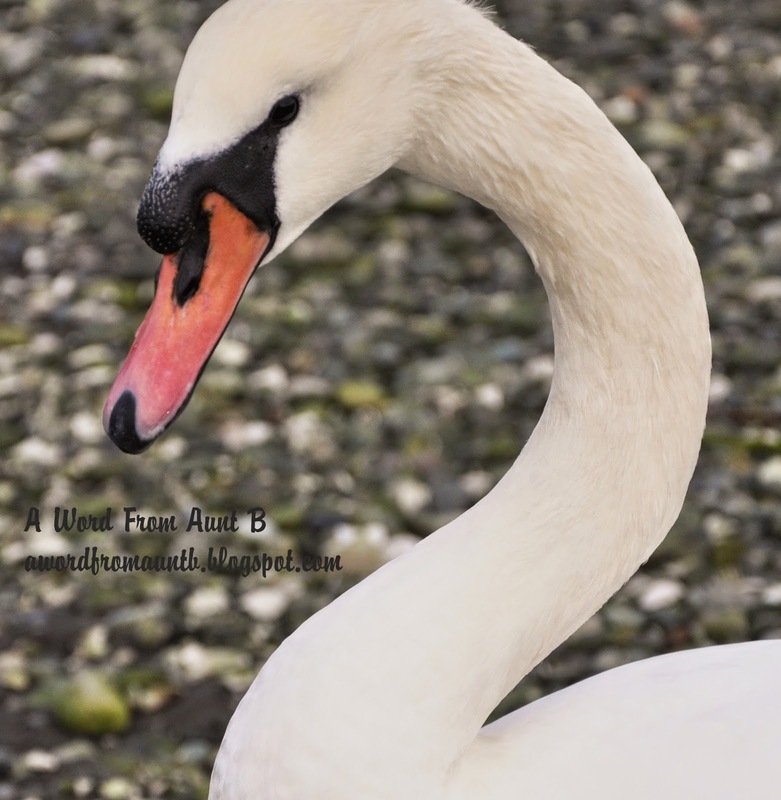 I return to the warmth of my car, and then to the warmth of my house, grateful for my time with the swans this morning, and for the camera which allows me to save their images for another time. I make a cup of tea and get breakfast on the stove. I return to the routines of my day. This afternoon when the sun is setting, I'll see the swans again. They'll wing past my window on their commute from estuary to inland fields, still as silent as ghosts, and seeming to glow in the light of the lowering sky: A gift of the season. I hope that wherever you are today, and whatever you are doing, you'll find the time to pause, and look, and listen to the world around you. I hope that the gifts of the season are yours to unwrap, and that they warm your heart, capture your imagination, and lift your spirits. Have a joyful day.